Day one of owning a Pit Bully. 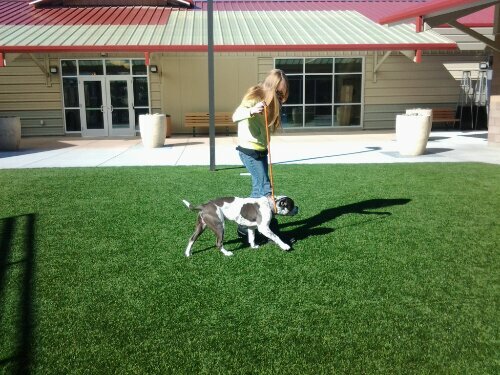 M walking our new Pit Bull Gandalf. He’s a 6 month old that was trained in the “Take the Lead”, part of the second chance program where troubled or incarcerated juveniles are put in charge of training a pup. He was taught sit, stay, down, off, watch me, target, and some other basic commands. It’s a good start. One thing we didn’t realize was that he’s going to gain another 20-40 lbs. He’s already a walking tank of muscle. One thing we are going to work on, continuously is manners. Some one like him needs to be very well mannered. He’s just to powerful not to keep well trained. We’re starting to crate train him. He hasn’t ever lived inside before. He was an outside pup until he was dropped off at the SPCA on Christmas Eve. He’s been there for almost a month. You know you live in a small town when you go to Petsmart and while checking out you mentiin that you just spent as much on stuff as you will for the dog. The girl behind the cash register says “SPCA?” I said yep, a 6 month old Pit. Her response about floored me. “You’re adopting Gandolf?!? He’s so lovable!” What? How did you???? It turns out she works at the SPCA part time and helped care for Gandolf. It’s a small world some times. Oh ya. And he snores. We put him to bed a few minutes ago and he’s snoring. It’s cute. I did discover he knows how to bark. He’s done so once. I turned on the TV, he froze, watched it for a few moments, barked at it once, then looked at me like “what is it? Is it dangerous?” When I just chilled he settled down and after a bit he didn’t even glance up anymore”. Amazing to think he has never, before tonight, seen a television before. This is going to be one loved mutt. There are three young ladies that are doting on his every need.